Bob T. was my best friend and we managed to get into a lot of trouble together such as the day we stole some pigeons from old man Therkelsen and Sheriff Starr made us take them back to the henhouse we had stolen them from. We were guilty. Bob lived with his family on the East side of Vashon with a high bank and a no name creek bubbling down the hill. Near the bottom of the hill, the old ram pump or water hammer,went kerchunk every few minutes and kerchunk again as a small piston drove another cup of water to the supply tank at the house. Water pressure from the creek caused the cylinder to fill, pushing the piston back against springs and shaking the ground at the next “kerchunk”, making a noise to be heard for a quarter mile, no motor, no electricity. Down near the beach, an old Maple tree leaned far out over the water with a huge rope hanging from a big branch some 30 feet above the ground and at high tide and by dragging the rope up the clay bank behind the tree, we could get a swing that threw us 40 feet out into the cold water, with lots of screaming as we reached the end of the swing and let go. Once while out fishing from his Dad’s rowboat, Bob yelled: “There he is. I see one”. We were after crab and Bob wielded a 12 foot long spear with a trident head as he leaned out over the bow of the boat. The 3 pointed spear was barbed so the crab or fish couldn’t get off. He let his spear down towards the bottom being careful to aim a foot or two behind the crab as light refracted the spear under water, causing it to appear to be bent up. Many a good shot had been taken with no good results because the spear was not where it appeared to be. Sole or flounder were other species conducive to good spear fishing. Mom and Dad hunted Dungeness crab with their friends and we weren’t allowed to go. They used a pitch fork to scoop the crab from the bottom in water that wasn’t too deep to wade. In Winter, the very low tides are almost all at night and the best crabbing was at Ellisport where they would build a huge bonfire to fend off the cold. 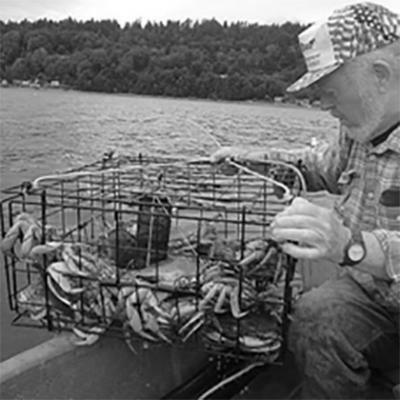 Dad’s waders were chest high and he trailed a galvanized tub on a rope behind him to hold the crab he scooped up from the bottom on his pitchfork. The two mantle Coleman lantern he carried had a piece of shiny tin behind the glass to reflect the light down into the water. A loud scream came from far out on the tide. Dad was in trouble. The crabbing was so good that night, that he had filled his tub to the brim and there were more crab on the bottom ahead of him. In his excitement, he started dropping the crab down the front of his waders and one of them grabbed him right in the stomach. There were lots of guffaws around the fire when Dad made it to shore, after a successful night of crabbing.